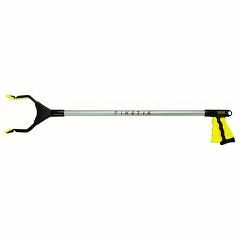 The PikStik Pro is a multi-purpose reacher designed for all uses. The patented design is strong, lightweight, safe and available in multiple sizes. PikStik Pro has an anodized dual channel aluminum shaft and rotating 5 1/2" jaws. Durable, non-slip gripping surface. Ergonomic handle and trigger. Lifts up to 5 lbs. (32" reacher). Does not pick up larger. round items due to. the angle of the grabber. Tips should face in. or be straight, not out..
small or flat items. small or flat items. in and outside user.. I also have the cheaper. suction cup one and. it works better for my me. I use both the suction cup one and this one. The suction cup works better then this one. The spread out design of the grabber is a flaw. The grabber is only flat at one inch. At max spread or less it will push round items away due to the outward angle of the grabber. The point of the grabber should be flatter or even slightly pointed inward to have more GRAB power on round objects like rocks or even larger round containers. I paid more for this one but I prefer the suction cup one. Nothing great about it. I will add some electrical tape to the ends of the grabbers so they are flatter when extended and hopefully that will help. it works better for my me. in and outside user.. Power wheelchair user. Handles weight,. Picks up small &large . I USE THIS WHEN I AM IN MY LIFT CHAIR OR HOSPITAL BED AND NEED TO REACH SOMETHING I DROPPED OR SOMETHING OUT OF REACH. This answer is late judging from the date of the question. The tubular shaft measures 13 inches. The whole unit measures 25 inches. It works well, but there are other grabbers that have magnates on the tip and a more arthritis friendly handle.